This interview took place in Berlin on July 25th, 1999. Rembert Hüser: In the film-installation you showed recently at the Generali Foundation in Vienna, Ich glaubte Gefangene zu sehen (I Thought I Was Seeing Convicts, 2000), the dead prison convict, William Martinez, is lying in the yard for nine minutes before he is taken away. Everything follows a precise choreography. Harun Farocki: I’m sure you are using the term ‘choreography’ because the yard resembles a stage. Guards, ready to shoot, have their guns trained on Martinez; a camera is lying in wait for an incident worth recording. Martinez is an inmate of a high security prison in Corcoran, California. He starts a fight with another inmate and is shot down. The surveillance video is silent. You see the white smoke from the shot glide through the frame. Then it takes nine minutes before Martinez is taken away on a stretcher. Allegedly the yard has to be cleared for security reasons, which takes some time. . Though the event looks very different from a movie, it gives the impression that it has to take place and could only occur in this staged, dramatic way; it looks predestined. RH: These nine minutes – during which prisoners are being cleared from the yard, one after the other, making the yard a cross between a chessboard, a billiard table and bowling alley – have been staged. 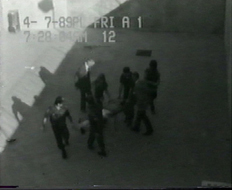 When the two men in business suits finally enter the yard and pronounce Martinez dead, the dramaturgy of the images approximates silent film style: “and then Martinez is gone” (here Farocki quotes a voice-over excerpt from an educational film which a civil rights group made about the event). And in your film there’s then another film, in colour this time, of the prison guards watching the role-play of a similar situation and laughing. We have graduated to a role-play which stages the education of educators. What formal techniques do you use to counter or comment on the alien material – material that represents the perspective of power, that’s comprised of faded, black-and-white images, a result of frequent over-taping. HF: I show these pictures in double projection, which results in a softer montage. The simultaneous words and images are suggestive rather then descriptive. Apart from this I try to be spontaneous, like the sudden ideas one gets during good conversations. This is also supposed to counter the merciless logic of execution. RH: This would actually sit quite well with the fact that your found footage material runs at different speeds. Sometimes you interfere with the material by varying the frame. You show footage from different types of surveillance cameras: normal video footage, but also infrared. Twice you inter-cut this footage with silent films: an inmate bribes a guard for the permission to embrace his girlfriend. Later, the inmate receives a letter in his cell, which announces the separation. All of this points to quite comprehensive research. Is your film part of a larger project? HF: Ich glaubte Gefangene zu sehen, only 25 minutes long, was the result of a sudden opportunity. The curators of the Generali Foundation in Vienna, Ruth Noack and Roger Bürgel, invited me to contribute to an exhibition with the beautiful title, “Things we don’t understand”. One year ago, I started working on a larger project involving images from prisons. It was about the representation of prisons in movies. But the money to research the project never arrived. So I started looking for footage from surveillance cameras in the US. As is well known, there are many more prisoners in the US than in any other rich nation. The “prison population” is growing steadily, while the crime rate is not! Most inmates are black, and many sentences are scandalously high – it was hard for me not to get carried away by the topicality of the issue. I was almost about to make a rabble-rousing film, a film like a pamphlet. RH: Why not? Recently they showed a Chinese film from the ’70s on the Arte-channel called Red Everest. 300 soldiers of the Red Army march to the top of Mount Everest and put a tripod onto the summit; only nine make it. You know, à la “Our common belief and the mountains”. Pure agitprop but with a lot of power. Admittedly, Ich glaubte Gefangene zu sehen resembles a film based on a piece of literature, but one that improves on the propagandist text. What I’m trying to say is you film an essay by Gilles Deleuze, “The electronic collar. A controlled society from the inside”, and you turn its quite theatrical theses about the controlled society into a field of work, into practice. How did you get the footage from the surveillance cameras? HF: We told the authorities that we wanted to document the new technology in prisons. Prisons are about the only place where productivity can’t be increased. There are more and more prisoners, but the guards can’t control 100 more prisoners every month. So they believe that appliances like surveillance cameras allow them to at least symbolically keep up with the general acceleration. And so we got the opportunity to either cut our own tape or obtain an old tape for copying. This is how we accessed images of water cannons breaking up fights between prisoners or from inside the visiting room where prisoners and female visitors exchange forbidden caresses. Suddenly there is the image of love defying the ban, like a law of nature! We also bumped into a civil rights advocate and member of the civil rights group “California Prison Focus”, who is also private detective. An interesting man – he’s a fan of Blumenberg and has a wonderful library. I can imagine him observing the back exit of a nightclub from a parking lot and reading a book at the same time, maybe something from Münster, about the book metaphor, i.e. the book whose meaning is the world. In short, we accessed hours of material from the recess yards in Corcoran: shadowless segments of a circle, completely within the field of vision of the surveillance cameras, and of course within the field of fire of the guns. You can see the prisoners playing sports, and frequently they start fights. Since the opening of the prison, there have been thousands of fights, and the guards have used their guns on approximately 2000 occasions. Hundreds of inmates were wounded, a few dozen were heavily injured, five were shot dead. At first the guards used a large-calibre anti-riot-gun, and then 9mm ammunition. HF: The irony has a different target. It’s becoming all too obvious that there never was any reason to shoot at prisoners. And since one can simply stop this, one can just as simply start it again for any minor reason. Although mass imprisonment, death sentences and executions in the yards have become anachronisms, they still happen. Political thought has to come to terms with the knowledge that such anachronisms do occur. RH: The title of your film is ambiguous. It’s a quotation from Rossellini’s Europe 51– Ingrid Bergman sees workers and says, “I thought I was seeing convicts” – and hence seems to endorse the programmatic humanism of this film. You know, like “now I finally see real people”. The archaic metaphors you use in your films – baking bread, slaughtering animals, coins, and gladiators – could sit quite well with this hypothesis. On the other hand ”thought” could also refer to “see”. And in this respect your demonstration of the surveillance technology in American prisons reveals that the very humanism in the name of which this technology was introduced generates the very violence it pretends to prevent, for instance, by turning prisoners into a video game. HF: Ingrid Bergman thinks of prison when she works in a factory for one day. In the end she is locked up in a clinic. 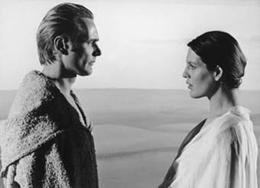 In Rossellini’s film, a comprehensive worldview comes into being. This worldview may not hold, but the film has great meaning for me because it emphasises an attitude of not wanting to acquiesce to a system of injustice. This is how I understand Angela Davis when she stands up for the abolition of prisons. It is the community’s obligation, not the obligation of institutions, to look after those who commit offences – this demand has a true core. But there are also activists in the US who spread the rumour that the whites want to re-introduce slavery. This is because so many prisoners are black and prison labour is exploited to such a high degree that it can compete with Chinese prison labour! Maybe the term “slavery” has its propagandist use, but I believe these matters can’t be understood in terms of economic theory. RH: But you do put economic categories to the test in your film, at least as far as prisons are concerned. “Prison”, “acceleration” and “increase” are parts of an inter-title – what are they supposed to mean there? Your research concentrates on the relationship between technology and body. On one side there are the inmates and guards (“They have nothing other than their body and membership in a gang”), on the other, the geometry of the recess yards in Corcoran, the radius of the cameras, electronic representations of identities in the control rooms, and total monotony and boredom. This scenario produces “expectable improbabilities”: love and death. What kind of economy is this? HF: The Draconian prison conditions in the US are in strange opposition to the general spirit outside. Deleuze says that the classical institutions of power, i.e. schools and prisons, are in crisis. Maybe this increase in locking people up is symptomatic of a crisis in the prison institution. I’ve been thinking about whether this could be the reason for the impatience with which those are dealt with who don’t comply. It’s like parents saying. “We’ve never hit you, and still…” The prisoners who fight although they know they’ll be shot at look like gladiators, but the spectacle is not public. Surveillance cameras parody publicity. They don’t broadcast the event. RH: Two years ago Jill Godmillow did a remake of your film Nicht löschbares Feuer (Inextinguishable Fire) from 1969. Her film is titled What Farocki Taught. She says: “Farocki’s got the images and they are lacking here. I’d like to import these images, that’s why I redo this film, take by take.” What’s it like for you when your own film comes back to you like this? HF: “To import the images” – that’s probably supposed to mean. “Take this film from the Federal Republic of Germany and turn it into an American thing”. My film was supposed to penetrate the US, to be effective. This is the effect noodles had – they originated from China and yet they’re usually regarded as being Italian. This is the kind of import that matters: to make something one’s own. Jill Godmillow recreated my film take by take in order to make it her own – on behalf of the US. Just like one copies a text one wants to concentrate on. For the film Between Two Wars (1977/78), I copied the text by Sohn-Rethel. I told myself that I did this to become completely conscious of the text. But I probably also did it to compensate for those things I owe to the text. Copying is, of course, also like doing a bit of extra work at school. RH: How do you view this film, What Farocki Taught? And how do you experience your old film in the light of the remake? HF: Actually, I hardly see Jill Godmillow’s film; I basically see my own. And I’m probably the only one to experience it this way. What Farocki Taught is usually shown on its own, without my film. In fact, it has played at many festivals and has even won an award. It is quite possible to see the remake without my original. But I only see my film through the remake, more clearly than ever, and I find this uncanny. Maybe it’s just this feeling of being removed, as if I occurred in someone else’s story, but with details only known to myself. When you are very close to a person you know in advance how to counter any critical remark. However, when I see my film through the remake, this closeness is taken away from me. In this respect it’s punishment too. RH: Godmillow’s intention is of a political nature. She says: “He’s doing things in terms of cinematographic aesthetics which we don’t know. These images are lacking here. We need them.” How is one supposed to imagine such an import of cinematographic aesthetics into a different film culture? Or into one’s own culture? How could one re-import Nicht löschbares Feuer into today’s German film culture? Which elements of your doctrine remain in the remake? HF: Nicht löschbares Feuer lasts. I think it’s great that something I made such a long time ago is still around. The film is full of things we couldn’t do, fumbling around, so to speak, and it is these things that create what I believe to be its aesthetic radicalness. We had the idea to use a 9.5mm lens for the entire film – a stupid idea. We had heard that Bresson was always using a 50mm lens, and, you know, we wanted to have the scenario where two people sipping coffee would say: “do you know that the entire film was done with a 9.5mm lens?” The ugliness of this film is due to the 9.5mm lens; it is similar to what the left wing radicals of Cologne (“Die kölner Linksradikalen”, a painters group in the ’20s) achieved in painting. Very different from the lithographs in Paris in May ’68 – they were designed as posters. RH: Was the cooperation with Godmillow and her team different from, let’s say, being interviewed about the film? RH: Can I get the remake rights for your other films? I would certainly pay you. HF: Of course. But what is a remake anyway? At first I think of those remakes where Hollywood says, ‘we can do this better’, where Hollywood buys the movie, copies it and destroys the negative of the original. (There was even a Three-Penny-Opera-movie with Curd Jürgens in the ’50s; the film by Pabst couldn’t be shown publicly afterwards.) I think that it’s different with music. I feel there is genuine actuality. What’s it like with Lauryn Hill and ”Killing me softly”? RH: SPEX (1) help us! HF: And then there are those strange remakes like Gus van Sant’s Psycho. I’m certain the producers think this is the only way to get people to watch a movie the title of which is already very well known. One just has to think about the fuss made about Marlene Dietrich in Germany. There is no cinema at the Marlene-Dietrich-Square that just shows her 10 best movies! But to copy a film take by take – this is really approaching the idea of performance. Let’s imagine one approaches films as scores, where the latter demand to be performed. Hence one copies a film not to greatly honour it or rob it but to participate in its production. In German, copyright musicians are called “creators after the fact”, but this is about ‘co-creators’. But you should buy different films with your dollars. Basically, you can’t just market famous films, you have to remake them. The remake is a kind of claim to the pre-existing film. RH: I’d just like to briefly stay with the political question. In 1982, Basis-Film advertised Etwas wird sichtbar (Before your Eyes: Vietnam) with the slogan: “One has to substitute pictures from Vietnam with pictures from here, one has to express Vietnam here”. The title page of the film’s press book reads: “We study the war against Vietnam and thus penetrate the US”. In 1998, we now have the American study of your German study of the American war (ie. Godmillow’s remake). In “The Case of California”, Laurence Rickels argued that the amalgamation of exiled psychoanalysis, Frankfurt School and Hollywood created some kind of a ‘German space’. Could you imagine penetrating the Federal Republic through a study of a Hollywood movie? What would you choose to remake? RH: Hitchcock himself could work differently. The stock of images on the shelves influences the way directors work; today, every filmmaker has videos covering film history. Tarantino is a very good example – his old job in a video store has had consequences. What’s it like with you? What effect has technological development, such as the AVID, had on the way you work? In Schnittstelle (Interface, 1995) you thematise the different places of work within the film industry. 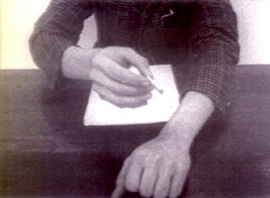 Film itself is moving towards Turing (2). HF: Firstly, all of those machines are too fast for me, even VHS. Working with AVID is horrible. I say to my editor: “shouldn’t we…” and before I have finished my sentence he has carried out everything. This can be counterproductive since I make changes to gain time. I want to be able to view everything from a different perspective, again and again, in the way one rephrases an idea after talking to different people, hoping that the idea might increase in depth and form. I don’t need fast machines and hardly use effects at all. Take for example a movie like Natural born killers (Oliver Stone, 1994). One can hardly believe that its first 30 minutes are to do with Oliver Stone at all; they could quite possibly exist only because it is so easy to edit with an AVID. There is hardly any material resistance against the ideas. I can imagine please using computers so as to show more than they can imagine. But the way I put things is always wrong! If the atomic bomb had been created with the help of computers one would say: “Without computers the bomb couldn’t have been built.” Of course AVID influences me even though I hardly use it – it influences me because other people use it. I can ride my bicycle from Berlin to Paris, but I will meet people there who are used to taking the plane and other means of communication. With cars it’s different – there are millions who understand these things right to the last bolt. This doesn’t turn them into Ford and Gates, but one can’t just dupe them. RH: Just one more detail. Machines offer different degrees of sensuality. A film projector is certainly much more sensual than a video recorder. In Schnittstelle you emphasise the tactile dimension of the editing table when you stroke across the reel. Is it just pathos, some re-potted Benjamin, or does one really do that? HF: Yes, I do that, though not like a farmer touching his clod after the Hundred Year War (that is, as some grand gesture) but out of impatience. The work at the editing table wasn’t proceeding quickly enough. I frequently forgot what I wanted to do before it was done. Touching the reel was pleasantly reassuring – like when you open a book and know immediately where you are. Also, on the editing table the image is not very clear, worse than an analog or digital video image. But there was always the idea that future projection would turn the caterpillar into a butterfly – you don’t get that with electronic images. There, you are dealing with 2 images! On the right, the edited image; on the left, the next image to be added. The right image makes a demand, but is also being criticised by the left one, sometimes even condemned. This made me experiment with two-reel-works, at first in Schnittstelle, and now in Ich glaubte Gefangene zu sehen. It’s a matter of ‘soft’ montage. One image doesn’t take the place of the previous one, but supplements it, re-evaluates it, balances it. RH: Last year, during the Kosovo war, you returned from the US to Germany. At that time, an earlier film of yours caught up with you: Bilder der Welt und Inschrift des Krieges (Images of the World and Inscriptions of War, 1988). A lot of the things you analyse in that film became current once again. Or to put it differently: your film from 10 years ago could be used to analyse the situation today. How do you view the film in relation to recent events? Was the situation in the media something of a boring déjà vu for you? HF: In 1990, during the Gulf War, I felt that my film was the key. I rang TV editors and sent them the VHS version of Bilder-Krieg (Picture War), the short TV-version of Bilder der Welt und Inschrift des Krieges. They wouldn’t have had to pay anything; the rights to the film were free. But before the editors had a look at the VHS, the war was over. I use the term ‘key’ in the sense of a door opening – a door to the matter itself or to the truth of the matter. Like one presses the ‘open’ key in order to open a document, not as a key to truth itself. I believe that the Gulf War is a good example of the technological military apparatus having its own dynamics and creating its own opportunities for action. But the Kosovo war seems to me quite different. I believe that the military seized the opportunity to act, but it didn’t seem to have created it. It’s interesting that the Gulf War has been almost forgotten – here and in the US. Bush wasn’t re-elected, only two years after his great victory. And nowadays no one remembers he existed at all. I don’t think this is due to people not remembering the television broadcast of the War. You know, they’re impossible to remember anyway since they’re just snippets of 60 seconds showing planes, or a camp and then a reporter saying, “and that was it and I am such and such”. No station can afford news items that are longer than three minutes. I think the thing is that there are no concepts for this war. There is nothing that would enable one to ‘understand’ it or at least remember it. RH: Maybe this is also to do with intellectuals having yielded to the general literary climate. I find the general silence and lack of memory absolutely scandalous. After all, this was our first war – yet since then it has all started to fade away: the Serbian Horse-Shoe-Plan, the ‘Good Will’ talks at Rambouillet, Racak and the great massacres – not to mention the consequences for the genocide in Chechnya” It almost looks as if we had begun an offensive without any international mandate – just to give the ”Frankfurter Allgemeine” and the government a change and allow them to publish war diaries. And no one wants to read the books. It is very helpful to watch your film again in this context, so as, for instance, to actually understand the function air-reconnaissance had in the press conferences of the Federal Minister for Military Prose. HF: In Bilder der Welt und Inschrift des Krieges I tried to convey my feeling that it was very dangerous that the earth is being surveyed precisely for the purpose of cruise missile control. I plundered the history box of images and deduced that one annihilates what one makes an image of. It’s the same with Poe: the image is a success, the model is spoiled. Making images annihilates the model. This is old knowledge, but it’s only since Hiroshima that we’ve had to fear the world being turned into a model for the purpose of annihilation. When I was working on Bilder der Welt und Inschrift des Krieges, those images (you mean television images?) weren’t yet accessible even though they soon became the completely new way of representing armed conflict during the Gulf War. RH: Your next film deals with a connection between air-reconnaissance and shopping centres. Can you explain this? HF: During the last few months, I have been researching shopping malls in the US, i.e. how they are designed and built. I came across a book written by students of Rem Koolhaas called ”The Harvard Book of Shopping”. They put forward the daring hypothesis that a lot of high-tech-companies once involved in the production of weapons are now producing high-tech-applications for the retail-industry, like electronic maps displaying the buying power of a suburb such as electronic maps which show the distribution of spending power in a particular suburb. There are also “crime predictors” for certain neighbourhoods. Now the target is the consumer, not the outside enemy. The writers of “The Harvard Book of Shopping” also mention that the General who did the logistics during the Gulf War went to Sears and saved the group from bankruptcy. RH: Is the mall-principle still expanding? I used to think saturation had set in. But from hat you are saying it sounds as if the ‘mallisation’ of American society is on the increase. HF: There’s certainly some saturation, but the investments of money and energy don’t stop. They’re putting new malls alongside old ones or extending old ones. 100 years ago in Germany, they built city centres everywhere – ensembles consisting of a town hall, a school, a police station, a church, a war memorial – that were supposed to give impulses and directions to the hinterland. Nowadays these impulses can or are supposed to lead to malls. Railway stations, public swimming pools, factory halls – everything is being turned into malls at the moment. These centres are supposed to offer a ‘complete’ experience – they are the effect of a totalitarian vision. Just like the current aim of Hollywood to create a situation where the desire for different films or a different way of filmmaking cannot occur any more. RH: Is this true? I don’t think that Hollywood is that totalitarian. Isn’t it true that there hasn’t been a clear divide between Hollywood and independent films for quite some time? Movies like Pulp Fiction, Fargo, Buffalo 66, Short Cuts and Magnolia exhibit different ways of narration or at least attempt to. I think they keep those desires you were talking about awake and put them into practice. What’s really bad are German feature films trying to be American. This results in patriotic American movies of the worst kind being made by Germans who want to establish themselves in Hollywood. And Hollywood’s answer is Mars Attacks. HF: War also emerged as an important theme in my research for Ich glaubte Gefangene zu sehen. Prison technology originates from war. For example, electronic sniffing devices that detect the minutest quantities of drugs, or eye-scanners that identify a person in a second. The logical conclusion of this narrative will be that someone exchanges his identity for someone else and thus escapes. That’s why I was thinking of war throughout my visit, of all those small, high tech companies. Strangely, however, the actual war in Kosovo didn’t seem to be present in the US at all. RH: I’d like to get back to Schnittstelle once more. In this piece, you – in an autobiographic manner – reflect on your place of work at a point in your career when you’re practically a canonical figure. Scholars write dissertations about you; you have international retrospectives at festivals and in museums; and there are the first video editions of your work. “Farocki” is a recognised figure of film history. When you are reflecting on your workplace, which includes watching your old material, at a time when your status is more obvious then ever – can your reflection free itself of the canonisation going on around you? Or does it change your perspective? Are you starting to envisage something like an oeuvre? HF: When you are 16 and love Jimmy Hendrix, you can’t understand why he took his own life. You wouldn’t do that if you were loved the way you love Jimmy Hendrix! I don’t look into the mirror in the morning and say: now you’ve finally entered film history. The book of film history is becoming more and more thumbed anyway. I have to admit that I’ve wanted to get there, and since this is somewhat embarrassing I’m mainly trying to use up my cultural capital by ploughing it back as the means for further production. And this is not easy. Straub and Huillet have been saying for a long time now that there is no film history anyway – let’s just think for a moment of those people in the Hollywood studio system who certainly don’t fit auteur status although they participated in the making of interesting movies. Film has become as difficult to survey as music. I realised in the US especially that there are subsystems that cannot establish connections to other branches. There is, for instance, a corpus of films which are taught, described and disputed only within university film departments. Amongst them are the films of Laura Mulvey, probably because her writings were so important to feminist film theory. Wanda (1970) by Barbara Loden – a wonderful film – is not, however, part of this corpus. The more writing on a film, the greater the chance such writing will continue, which makes texts about films more important than the films themselves. RH: I think this is also a problem of the way universities archive. Today, real enjoyment of film tends to be inspired by video. Those who are seriously into enjoying films beyond the visual screen-feast operate from a video collection – and they are happy when they have the opportunity of the ‘genuine’ experience when one of their films is shown in a theatre. Otherwise one comes home from the movies and sits down by the bookshelf again, thinking: wasn’t there a quotation? And one finds a nice chunk of Nietzsche retrospectively. On the one hand Mulvey and Loden really ought to be shown on TV so that everyone can tape them, on the other hand the media collections of university libraries have to be prevented from getting used to getting everything for nothing. This requires a change of the scale of values. ‘Videos’ don’t figure in the same way in the library budget as ‘books’ do. This is, of course, also due to the fact that video hasn’t got rid of its smutty image, even amongst film scholars. Their discipline doesn’t believe in video. What does this problem look like from a filmmaker’s perspective? HF: When video came out, its importance didn’t lie in the fact that everyone could get hold of a camera. The main thing was that everyone could buy a recorder. Despite the fact that the secrets of production had disappeared, no one was interested. Before then, however, no description was correct. Essays were saying the most absurd things about films – their contents and their making. All of this was completely untenable. I find it very interesting that it is possible to make a film with almost nothing while at the same time TV stations aren’t buying things any more. When Hellmuth Costard tried to improve Super-8 technology, his aim was to be able to produce with a tighter budget and a greater time frame. That’s what I need as well: I need to be able to have time to select, contemplate, cut – otherwise the outcome is average. In this respect I have been envisaging an oeuvre for quite a while. RH: Let’s stay with video for the moment. The first edition of your films has been released in the US. How do they advertise the “Farocki product”? Can you describe how the films’ covers are illustrated? How does their interpretation of documentary film express itself? Did you have any say in the cover design? I understand they didn’t take the film posters. HF: Facets in Chicago is something like a mega-video-store. They have 35,000 titles on offer, and Milos Stehlik, the owner, is taking the greatest pains, for instance, to hunt down a better Godard copy in Canada. The covers of my films look, I guess, as if I were a DJ. RH: Do you think auteurs should have their own TV channel? A station that only buys works from Farocki, Costard and Loden? HF: It is quite possible that the 150th or 300th channel would be appropriate for my films, but I would receive so little money that I wouldn’t be able to produce on this basis alone. Since there is no money, such programs should at least be made by underground people, so that the result is interesting. We need new ways of recording and exhibition anyway. RH: In the feuilleton of the German newspaper, Süddeutsche Zeitung, they recently quoted Houllebecq within the context of pop culture: “When, in a conversation on literature, the word ‘style’ is mentioned, you know that there is some time to relax, look around, order another beer.” How do you read film criticism/reviews in this age of relaxation when everyone thinks they have happily survived the days when style was everything? How do you explain that the status of your scripts found a much greater, and a much more playful resonance in the film critiques then current, than nowadays, when it seems to be absolutely alright to reflect on performance alone? RH: Sure, but such texts are only written for parties anyway. Here it would be Deleuze. Or Luhmann. Or Enzensberger. Or Butler. Or Turing . It depends on the respective scene. It’s just a pity that the underlying problem is only ever realised by those theoreticians who happen to be on the current out-list – whose fans have to sit in Hawaii, far away from the centre. It’s never said that the more theoretical discourse is burdened by names and lemmata, the less it enters thought. However, the man from Hawaii, even though I haven’t read him, is right about the fact that much more should be written about Westerns. But you didn’t intend to make a fundamental critique against theory-guided observation of film, did you? HF: Absolutely not, my years in the US have changed my mind. I never cared much about Fassbinder, not only because he was so far-reaching, but also because he had no style. As you know, he was influenced by Straub and Brecht, but broke with the rules of this school. He returned to characters who offered identification even though it was mostly via melodramatic exaggeration. Kaja Silverman and Thomas Elsaesser have explained how Fassbinder shows politics in love, exploitation in sexuality. These writings have enriched Fassbinder’s films, not only visually, but also intellectually. I also understood that something I deemed impossible applies to Fassbinder: he can communicate something that can’t be found in the ‘language’ of his films, only in his intentions. His intentions express themselves, just as it is possible to say more in a foreign language than your actual limitations allow for – a lovers’ experience, I think. RH: In your films you are constantly dealing with film history; sometimes this is really obvious. Apart from Godard there are not a lot of people who do this well. 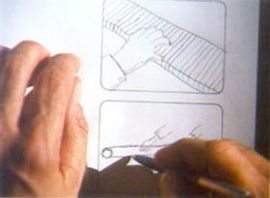 That’s why I would like to establish a connection between your two projects Der Ausdruck der Hände (The Expression of Hands, 1997) and Arbeiter verlassen die Fabrik (Workers Leaving The Factory, 1995). Would you mind explaining your specific techniques of sequencing, material selection and association? HF: In 1995, when cinema turned 100, I had the idea of taking the Lumiére film, Workers leaving the factory, and looking for examples throughout film history where workers are leaving the factory. Of course there are stars such as Chaplin and Monroe, but there are also employees and workers from Siemens in Berlin ’34 who are departing for a Nazi-rally. There was also an East German factory brigade pulling out in uniforms and armoured cars to arrest agents provocateurs in the forest – one learns later that it’s just an exercise. The real enemy of the working class cannot be shown, or it is too dangerous to turn him into a character. I collected scenes from the US and Europe and from every decade of film history. Doing this, one can learn a lot about “filmic expression”. Firstly, workers can’t be recognised as such once they have walked out of the factory gate. One moment later and you can’t distinguish them from passers-by. Secondly, it was once the common belief among communists that economic struggle would turn into political struggle – the factory gate would be the ideal place to observe this. But no communist regime rose to power or collapsed in this way – if you disregard the Lenin-dockyards in Danzig. More than anything, it’s a great pleasure to have – sometimes quite similar, sometimes very different – versions of the same process before your eyes. I would love to have a book with 1000 versions of the motif “A woman takes something away from a sleeping man”. Another thing: how is soap being held? In ads, women hold soap like perfume. I think this is because actual washing would refer to dirt, which is not supposed to exist. RH: How would you draw a line between your methods and Godard’s in the Histoire(s) de cinémaproject? In your analysis of Le Gai Savoir (Jean-Luc Godard, 1968) in Von Godard Sprechen you and Kaja Silverman write: ”Even Godard doesn’t have to read all of the texts he quotes”. This is quite clear. Maybe, under certain circumstances, it’s more to the letter not to follow to the letter. HF: I think Godard undertakes different studies. In Histoire(s) de cinéma, I had the impression that he is always immediately removing himself from the material. He makes one intellectual observation, then another, and then compares them – literalism is lacking. His first main idea: Sternberg lights Marlene Dietrich in the same way as Speer lights Hitler – this isn’t quite true, but it’s a great idea. He’s after these really great things. A cultural history of light – maybe there are even links to the French school of historical writing. My own reference point is more something like the ”Archiv für Begriffsforschung” (Archive for Research into the Development of Concepts). The Archiv explores old structures, such as the use of ”genießen” (to enjoy) with genetive, as in J. S. Bach: ”Genieße der Ruh” (enjoy ‘of’ peace). It is a matter of word fields and changes of meaning, but also about the creation of new words. There is one film, La Incerta Verfica (I don’t know by whom), for which they bought about 40 feature films at the rubbish tip and then intercut them. So you see Curd Jürgens saluting on a ship that’s firing a broadside and then girls in bikinis jumping into the water from a yacht. Cutting into the St. Tropez movie makes one believe that the girls want to save themselves; at the same time you realise that this is, of course, not the case. This aspect, that ”things are not quite working the way they should”, makes it very clear that filmic narratives have standard expressions too. This is how I came to imagine some kind of film thesaurus, a little like the one that comes with a word processor. You click on a word and you don’t just get the synonyms, but also a set of similar sounding words you could have meant in the first place! When you have to narrate that a woman is taking something away from a sleeping man – what do you have to expect, how can you counteract expectations? I’m quite surprised that this is so seldom done, and that film archives and research institutes sample and compare so little. RH: Can you give an idea of how you research a film? I saw that the end credits mention several research teams in different countries. HF: I have been working with researchers for almost 20 years, there are some long term working relationships. At the moment I’m working with Cathy Crane, Brett Simon, Stefan Pethke and Matthias Rajmann. As far as script-less films are concerned, these people are of course co-authors. When you are looking for an event, it is quite possible that for 1000 times it occurs in a way that you can’t film or that montage becomes impossible. This is a little like looking for the suitable scene for a feature film. It’s not sufficient that just certain prerequisites are fulfilled, such as a house having triangular balconies. The scene has to communicate something by itself. I like this factuality film requires – something has to exist and it has to be there now so that you can film it. This is indeed about making that which is general concrete. It’s very easy to say ”workers leave the factory when work is over”. But it is very difficult to find out when and where this happens and, especially, that the image transcends what is expressed in the sentence, that it has a value of its own, something beyond being the equivalent of the words. We have indeed looked for a door on a third floor without a balcony before it, or rails running straight towards the sea – and we found both. Our experiences right now, with the mall-project, are similar. I have found enough papers about how people tried to measure the speed of customers: are they accelerated by certain floorings or slowed down? How do they move through space ? How can the figuration of space influence their movements and emotions? How can they be guided through special furbishing? It’s important to find current studies of this kind – studies in the ‘taylorising’ of the consumer. Production and distribution have already become matters of science – now it’s the consumer’s turn. This kind of science clearly is some kind of magical practice – legitimation and self-ascertainment. RH: What makes a topic your topic? Thinking of a film such as the one by Gorin –Routine Pleasures, where you have five old men doing maintenance work on a model railway – this is a great film but one knows immediately that it couldn’t be one of yours. It’s not one of your possible topics. Your quite elaborate procedures allowed you to observe all different kinds of labour. Is there some kind of common denominator to your films? What are the things that get you immediately involved? HF: An important prerequisite for the kind of research that underpins my work is attention to detail – just as in American detective novels. Things like the German police using the acronym SMS for ”politically motivated street violence” or that it is forbidden to repair tyres designed for high speeds. I’m very interested in the origin of words. I like looking them up – this leads to a lot of stories, but doesn’t generate genuine knowledge. A filmmaker doesn’t have a ‘field’ – that’s why I’m so crazy about details. RH: How does this research translate into images? There is this game Carl Schmitt liked to play with his guests: where he would ask them from which book a specific sentence derived. This is quite dull hermeneutics – you know, the forced logic of main and subsidiary passages – but it can sometimes still be quite productive. Would you be able to say about one or the other of your films: ”this is the image from which I made this film”? Is there, for instance, already an image that is going to be pivotal to your mall story? HF: No, I don’t start from an image. In the case of Videogramme (1992), I proceeded from an imagined situation. I read the book by Amelunxen and Ujica about the revolution in Romania and thought of a film in which a few people sit in front of monitors, look at and analyse sequences of images – just as one is discussing such sequences at the editing table during a seminar. The film turned out very differently. With malls, it’s again different: you can’t exactly film malls, they just look like junk mail; it’s easier to film barbecue sausages. This film can only be about the production of malls. It has to focus on events that bring those malls to life. That’s why the starting point is not an image but the rather the difficulty arising from the impossibility of making a concrete image. HF: In Deutschland im Herbst (Germany in Autumn, 1978) there is the cooperation, or rather the clash between Kluge and Fassbinder. This makes the film interesting, although some of the contributions are terrible. Kluge is just too much of a monomaniac to make cooperation possible. He is like Kraus with his ”Fackel” – one would have to start a different journal. At the beginning of the ’90s I tried to instigate some kind of media magazine on TV. We were unable to push it through, there was no slot for it. But even worse: we were unable to assemble a group of such distinction that would have made it seem scandalous that we didn’t get the funds for our project. RH: As far as the history of your projects is concerned – would you be able to give a brief sketch of the people behind you? And what changes have occurred in the TV world? RH: This means that an entire type of film is gone with these editors when they retire? HF: At WDR it looks as if they are going to get rid of the film editing office when the – already reduced – staff reach retirement age. Their budget has halved, and there are now a lot of Heinz-Rühmann-movies instead of the rich and diverse productions from their archives. NDR’s third channel is the same story – one can’t imagine Klaus Wildenhahn amongst all of those picturesquely folksy concerts by the harbour in low German dialect. I have always been producing at the very margin of this channel, and even this won’t be possible any more with the kind of program they’re planning now. Certain homeless people just don’t manage to move to the airport when the railway station is closed down – which is not to say that the old railway station was anything special. RH: How helpful is ‘essay film’ as a category? Baumgärtel, in his Farocki-book, has found the following categories for your films: informative film, auteur film, observation film, essay film and found-footage-film. Wie man sieht, Bilder der Welt und Inschrift des Krieges, Was ist los? and Schnittstelle are essay films. Leaving the other categories aside: what’s ”essay film” supposed to mean? Something that’s not quite a film? Doesn’t this create a category for something that’s a fundamental problem for every film? Why is Arbeiter verlassen die Fabrik not an essay film? Or Nicht löschbares Feuer? Or Beiträge für Sandmännchen? Or Faces by Cassavetes? HF: This category is just as unsuitable as ”documentary film”, sure. When there is a lot of music on TV and you see landscapes – they’ve started calling that essay film too. A lot of stuff that’s just relaxing and not unequivocally journalistic is already called ”essay”. That’s terrible, of course. That’s as vague as those ”experiments” from the ’50s. Enzensberger wrote then that the scientific concept of experiment was completely unsuitable for art. The term ”essay” has become subject to a similar vagueness. But to me narrating and disputing are still very closely linked. I strongly hold that discourses are a form of narration. World War II hasn’t quite made it into a novel by some new Tolstoy, much rather into the ”Dialectics of Enlightenment”. RH: Are genres important to you? What about hybrid forms and genre transitions? HF: Last year Kaja Silverman and I conducted a seminar in Berkeley. It was about making films from stills. We were watching such films and students had the opportunity to make them themselves. I was completely overwhelmed by the result! Some films were excellent, and more than half very interesting – which is much more than you can even expect from a festival! This is because of the subject matter: when you turn photographs or other still images into something, you don’t compete with the omnipresent narrative-machine. When you show a boy who starts talking to a girl at a coffee shop, you are immediately subject to standards: does it look like Neighbourhood TV, like an independent film or like the work of a student? When it’s about putting stills into a sequence, to read them, a new kind of competence arises. There’s also some new versatility in making script and images approach each other on the computer screen. Maybe there’s a new idiom on the horizon. Helmut Färber wrote that film was similar to tonal languages where intonation is more important than syntax. RH: Do you think that the classical difference between ”reception” and ”production”, between film academia and film production won’t continue to exist for long? HF: In Berkeley there’s not really any film production, just film studies. There, film production takes place to make people understand how film works, not to teach them film production. Everyone who studies literature writes – not to become an author, but to understand writing. Understanding by doing – similar to the things we said about doing remakes. RH: In 1998, for the Christmas-edition of Jungle World you wrote a text on Holger Meins. An unusual dossier, given that it appeared in a journal. It works like a book whose leaves have remained uncut – you press down in the middle and the pages come to lie besides each other. Why did it take you 30 years to cut the leaves of your book on ’68? HF: I don’t want to badmouth ’68, but I’m still quite hung over from it. I once read that the French people shouted ”The King shall live!” at the beginning of the revolution – by this they wanted to express the overthrow of the monarchy. I have the same feeling: we said something completely different from what we meant, and nowadays it seems as if our intentions had been right. It’s a little like my film Unlöschbares Feuer, where I achieved something contrary to my intentions. (Of course, I like achieving more than I intended, but not something different.) We believed or postulated that it was possible to ”make history”. That’s why we played down national socialism, and why it was beneficial to denounce capitalism as the ultimate stage of national socialism. In this respect we were – unwittingly – very similar to our parents’ generation who wanted to get Hitlerism behind them as quickly as possible. HF: Yes, ’68 was some kind of cultural revolution that overcame pre-war ethics, ethics best described by the word ”austerity”: parsimony, sacrifice, discipline. This attitude towards life didn’t match changed circumstances, and pop made things explode. There was some need for blood for the sake of emphasis: street fights, hijackings, assassinations. You could say: blood for pop. With regard to Holger Meins: this film, O. L., it’s going to remain and it can’t be put into the context of his other works at all. The only thing you could say is: he realised that he knew how filmmaking works and that’s why he lost interest. Spex is the main music magazine in Germany. Allan Turing, inventor of the computer, is referred to in Interface. Rembert Hüser was a Research Fellow at the Institute for Media Studies and Cultural Communication at the University of Cologne, 1999-2001, during which he worked on the history of the Hollywood credit sequence. 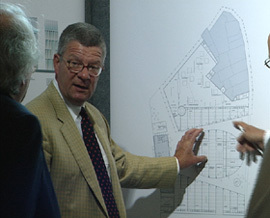 Since 2001, he is Visiting Professor of Film Studies at the University of Visual Arts, Braunschweig.